Waste Heat Recovery System Market in 2018, was valued over USD 40 billion and is predicted to expand over 8% by 2025. Growing significance of energy conservation coupled with stringent emission standards across the globe will stimulate the market size. Energy intensive industries including petroleum refining, cement, glass, heavy metal manufacturing, and chemical are some of the prominent application areas with significant waste heat recovery potential. WHR systems on account of their ability to reduce operating costs and generate onsite electricity and heat are set to gain significance in the coming years. Government initiatives aimed at reducing carbon footprint while improving energy efficiency will drive the WHRS market growth. Ongoing technological innovations have significantly improved the efficiency and reduced the system cost which will simulate the business growth. In addition, increasing consumer awareness toward environment protection and effective waste heat utilization will further enhance the industry outlook. 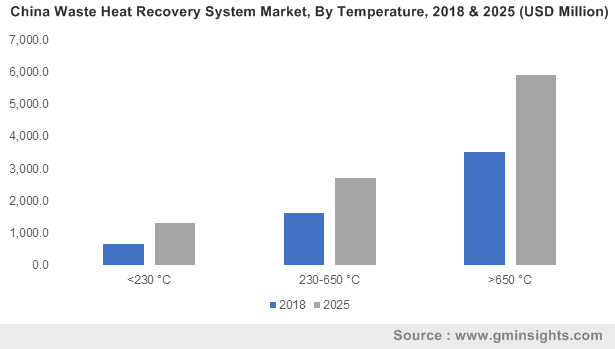 Waste heat recovery system market from preheating application was valued over USD 20 billion in 2018 and is set to witness robust growth over forecast time frame. Reduced greenhouse gas emissions, application flexibility, and its ability to provide high energy efficiency are some of the key features which will boost product adoption in coming years. Ongoing efforts to reduce GHG emissions along with increasing electricity prices will drive the WHRS deployment for electricity & steam generation. Growing focus toward enhancement of plant efficiency along with growing demand for onsite power generation are some of the underlying factors which will drive the business growth. Rising investment toward sustainable waste heat utilization across industries will further propel the demand for WHR systems. <230 0C WHR systems are primarily deployed across pulp & paper, food processing, chemical and other medium scale industries. These systems allow the plant operators to reduce the operating costs, improve the energy efficiency of their sites and reduce the industrial CO2 emissions. Ongoing expansion of co-generating units for sustainable waste heat utilization will further contribute toward industry expansion. >650 0C waste heat recovery system market is predicted to expand over 8% by 2025. Deployment of high temperature heat recovery units involve capturing of exhaust heat from existing industrial process including cement and glass industries to generate electricity. Lower maintenance cost and ease of operation are few key features which will favor the technology deployment in coming years. Food & beverage in 2018, accounted for over 4% of the global waste heat recovery system market size. Availability of low temperature waste heat coupled with growing investment toward expansion of food processing units will drive the WHRS deployment. 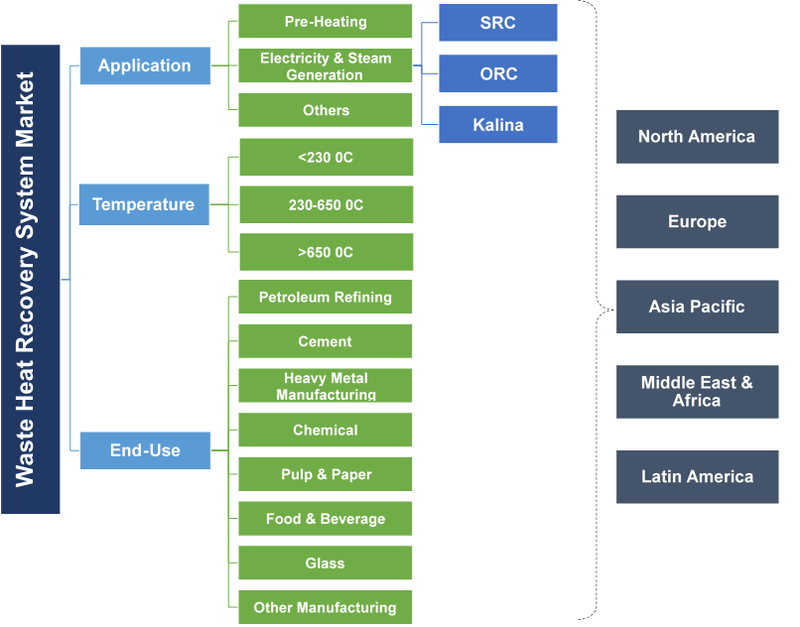 Growing significance of ORC-based systems on account of its ability to recover heat from low temperatures sources will further favor product adoption over the forecast period. Growing demand for uninterrupted and reliable electricity coupled with shifting trends toward sustainable exhaust heat utilization will stimulate the market size across petroleum refining industry. High quality waste heat from the exhaust streams of refineries can be utilized for electricity & steam generation resulting in reduced operating costs. Rise in demand for refined petroleum products along with increasing investments toward expansion of refining capacity will further favor the WHR system market growth. North America market share will expand on account of growing demand for onsite power generation along with increasing investment toward deployment of energy efficient technologies. Stringent emission standards along with declining technology costs has resulted in expansion and retrofitting of the existing industrial facilities which will further stimulate the product demand. Germany market is anticipated to surpass USD 5 billion by 2025. Establishment of emission standards along with ongoing efforts toward reduction of greenhouse gas emissions will boost product deployment across heavy industries. Supportive policy environment, technological innovations and declining costs are some of the eminent factors that will boost product demand over forecast time frame. China market is set to undergo robust growth on account of ongoing investment toward industrial sector development. The cement, heavy metal manufacturing, glass, and refining are some of the key energy-intensive industries in the country with a sizeable potential to recover waste heat. The introduction of financial incentives and energy efficiency standards across major manufacturing sectors with an aim to reduce emission levels will further complement the industry growth. 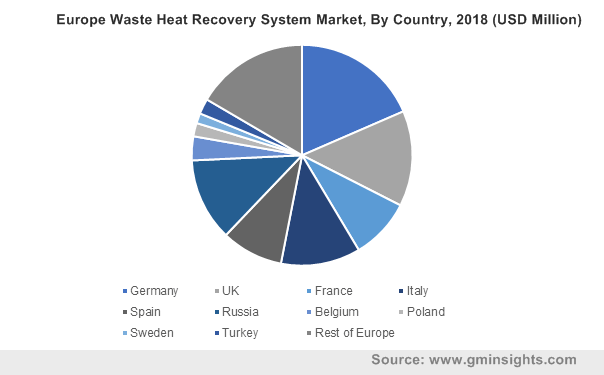 Prominent industry players operating across waste heat recovery system market include Boustead International, Promec, HRS, Climeon AB, Aura GmbH, IHI Corporation, Cochran, AMEC Foster Wheeler, Mitsubishi Hitachi Power Systems., Forbes Marshall, AC Boilers, Siemens, Thermax, Rentech, Bosch Thermotechnology, Viessman, General Electric, Walchandnagar, Exergy SPA, Ormat and Dürr Group. Strategic collaborations, overseas business expansion and mergers & acquisitions are few of the significant initiatives undertaken by the eminent industry players. Moreover, the companies are also involved in substantial research & development to gain competitive advantage over other participants. Waste heat recovery is the collection and utilization of heat produced as a by-product fromvarious industrial process. Ovens, furnaces, turbines, exhausts engines, etc. are some of the key contributors toward waste heat generation across industries. This waste heat can be utilized for preheating and electricity & steam generation resulting in increased efficiency and reduction in carbon footprint.